Tomahawk Creek Middle School technology club members: Ethan Hewitt, community mentor Doc Davies, Kyle Burton, Mia Shaver, moderator Teresa Hockenberry (left to right) and Austin Lubniewski and Eden Johnson (seated). “For Landri, we’ll be making the RIT arm. It’s designed specifically for people who have an elbow but not a wrist,” says eighth grader, Kyle Burton of Chesterfield. As a member of the tech club at Tomahawk Creek Middle School, Kyle gets to help improve people’s daily lives in a profound way. by bending her elbow, a motion she’ll have to get used to through practice. When I volunteered as an assistant in my son’s middle school library a year ago, I had no idea that I would find such an inspiring story. Like many school libraries, Tomahawk Creek Middle School’s media center serves as a meeting and work space for several different student clubs and organizations. One day, while reshelving books, I couldn’t help noticing an energetic circle of kids working on what looked to be robotic hands from the future. These students were part of TCMS’s 60-member-strong technology club. 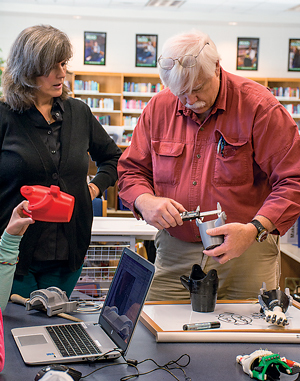 Creating prosthetic devices for those who need them is just one of the remarkable projects this group undertakes. 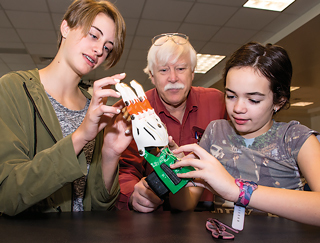 According to media specialist and technology club sponsor, Teresa Hockenberry, her students work with local experts to create adaptable hand and arm devices for amputees at no cost to the recipient. They do this through a global network of volunteers called e-NABLE. The room is abuzz with student led productivity. They have a new client, recent VCU graduate, Landri Peirce, whose left arm ends just below the elbow. I still can’t get over how mature and professional these kids are as they undertake the initial steps in developing Landri’s new limb. Bruce “Doc” Davies is the club’s mentor. Like an on-site Bill Nye or Inspector Gadget, the retired biochemist offers students his engineering expertise and guidance when they need it. 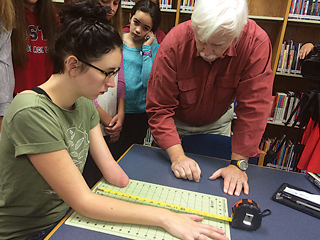 As director of the MakerSpace at Chesterfield County’s central library, Doc was one of e-NABLE’s earliest proponents. His enthusiasm is contagious. Doc estimates that through the combined efforts of Tomahawk Creek Middle School, L.C. 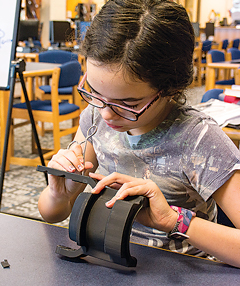 Bird High School, and the public library’s MakerSpace, local volunteers have printed, assembled, and facilitated the fitting of twenty-two hands for people here in RVA, in other states, and across the globe. On a larger scale, e-NABLE community members throughout the world have used 3D printing to create more than 1,500 devices for people in fifty countries. two inches of forearm she was born with. Another student enthusiastically opens her Chromebook to show me e-NABLE’s website. The site not only contains all sorts of information about the program, but also features design blueprints for volunteers to follow. They all have names based on their features and benefits. There’s the Raptor hand, the Talon hand, the Cyborg Beast device, the Limbitless arm, and Landri’s model, the RIT arm, named for the Rochester Institute of Technology professor who developed it. Each design can be customized to a recipient’s hand size, strength, and other specifications. As if the life-changing potential of the student-led initiative isn’t impressive enough, it’s important to note that these middle schoolers aren’t just following the blueprints. They’re brainstorming, making advancements, and solving problems to improve people’s lives along the way. For example, a few kids look on as one carefully removes the Velcro used to attach the RIT arm prototype onto its user. Now they’re replacing it with what looks like an elastic headband. “We’ve noticed that the Velcro can get uncomfortable, rubbing against a person’s skin,” explains seventh grader, Eden Johnson. “So, now we’re experimenting with elastic athletic bands to see if they’ll work as well as the Velcro does.” She goes on to say that if the bands aren’t a suitable substitute for the Velcro, they’ll experiment with different types of padding to insert between the Velcro and the user’s arm. If it works, the club will share their discovery on e-NABLE’s website for other volunteers to test. This modification, developed by Chesterfield County middle school students without engineering degrees, could become a standard part of the arm design. As for Landri, this hip twenty-something hasn’t let being born with a little over half an arm slow her down. She is, however, looking forward to having another hand for balance while riding her bike. The table in the media center, displaying half-a-dozen devices printed in a myriad of colors, makes it clear to me that these are not meant to be clones of human hands. 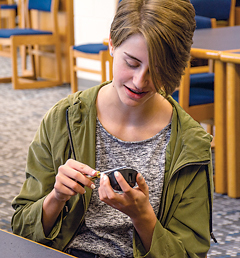 “People get to choose the color of their new hands as well as any designs they’d like on them,” explains Kyle, a third-year member of the tech club. Landri has decided she wants a purple one. When we think of more typical prosthetic hands and arms, we envision flesh-toned, high tech appendages that are cumbersome and not always user-friendly. Trying to keep the terms straight for these 3D models can be tricky, but after a sit-down with another tech club member I was enlightened. “We’re careful not to call them prosthetics. We prefer the term ‘devices,’” offered eighth grader Austin Lubniewski. “People tend to think of prosthetic limbs as expensive and bulky and designed to try to look like they’re a real limb, but they’re not (real).The devices we make are simpler, but still really helpful.” To illustrate Austin’s point, another student handed me one of the device prototypes from the table. It was surprisingly lightweight. These astute middle schoolers seem wise beyond their years in their ability to see things from the perspectives of their recipients. “I think the fact that the hands we’re making aren’t designed to try to look like a real body part helps kids to feel more comfortable with them. No one’s trying to pretend it’s a real hand,” adds Ethan Hewitt, another technology club member. Later, Doc told me about a kid who wanted a superhero hand device. With standard prosthetics, recipients can go through months of fittings and physical therapy in order to receive a new limb. By contrast, e-NABLE volunteers can customize, print and assemble one in just a few days. This is a big advantage over standard prosthetic devices, which can be out of commission for weeks if something malfunctions. Plus, insurance companies tend to pay for only one, which a kid can grow out of in just a few months. Hearing the students talk enthusiastically about their work and putting themselves in the shoes of someone a little different from themselves is really inspiring. I wish every kid could have the learning experiences that are part of a day’s work for these middle schoolers. While I’m super impressed with what I’ve seen and heard about during the course of my interview (and yes, while eavesdropping as a library volunteer), Doc says it’s nothing compared to the day the tech club teams present their recipient with his or her new hand. Doc says it’s fairly simple for schools, churches, businesses and other organizations to join the e-NABLE community. Getting started requires a 3D printer, access to a computer with a CAD program, cameras, and a few hand tools. However, anyone can get involved and volunteer on their own through the Chesterfield Public Library’s MakerSpace. 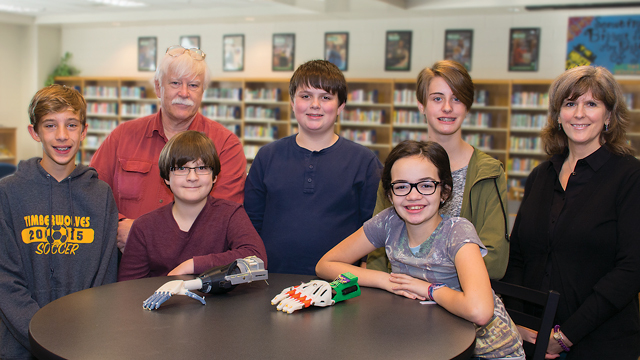 Doc is always happy to meet with schools to help them develop technology clubs or after school programs and to speak with those interested in receiving a 3D printed hand. Angela Weight is a freelance writer and blogger who recently moved to Richmond with her husband and two sons. Her laugh-out-loud accounts of life’s ironies and irritations can be found at at Sanity Waiting to Happen.